There are at least six kinds of anxiety-relatedprocrastination. Here’s how to understand and start overcoming them. 1. Procrastination due to your working memory being overwhelmed. For example, you get overwhelmed by all the notices that your child brings home from school. They need their swimming gear on Thursday, something for Show-and-Tell on Monday, $2 for something in two weeks on Wednesday etc etc. If you’re like my therapy clients, even putting things on the calendar as they come in feels overwhelming or your calendar gets too messy. The solution to this is to find a way to be reliably reminded only at the time you need to think about something. Some of my clients have liked an idea that comes from a book called Getting Things Done. How it works: Get 31 cardboard folders – label them 1st, 2nd, 3rd for each day of the month. I like to use “file jackets” for this purpose rather than manila folders (so that things don’t fall out). When something comes in that you need to add to your to do list, file it in the correct folder based on the day you need to think about it. Reuse the folders the next month. Reducing the need to make decisions about what to do with new information will free up your willpower for other things. 2. 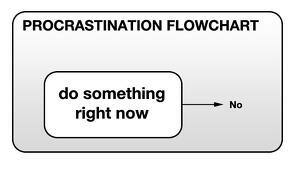 Procrastination due to Intolerance of Uncertainty. Intolerance of Uncertainty is an important cause of anxiety problems. – You have a general tendency to stay stuck on pause whenever you feel uncertain about doing something (you avoid situations and tasks that involve feeling unsure).